We’d love your help. Let us know what’s wrong with this preview of The Librarian of Basra by Jeanette Winter. To ask other readers questions about The Librarian of Basra, please sign up. هي قصة السيدة علياء أمينة مكتبة البصرة التي رأت ان الكتب لا تقل اهمية عن حياة البشر . وانقذت ما يقارب الثلاثين الف كتاباً من التلف , ضمنها كتب تعود الى 700 سنة . لم تبالي لأهمال المسؤولين وحافظت على كنزها وكنز اجدادها وتراثهم . بطلة عراقيه يجب أن لا ينُنسى اسمها و قصة يجب أن تروى للصغار ليكبروا على حب الكتب وتقدير قيمتها النفيسة . According to Jeannette Winter's excellent and informative author's note, Alia Muhammad Baker (who was the chief librarian of Basra, Iraq, and indeed even that fact is remarkable, as it shows that while Saddam Hussein might have been in many ways a vile dictator, in his Iraq, women were obviously often employed in important and leadership potential careers) managed to save 70% of the Library of Basra's collection of books before the library burned in April 2003. Not only is it amazing that this b According to Jeannette Winter's excellent and informative author's note, Alia Muhammad Baker (who was the chief librarian of Basra, Iraq, and indeed even that fact is remarkable, as it shows that while Saddam Hussein might have been in many ways a vile dictator, in his Iraq, women were obviously often employed in important and leadership potential careers) managed to save 70% of the Library of Basra's collection of books before the library burned in April 2003. Not only is it amazing that this brave woman, this librarian, this book lover par excellence, managed to save the majority of books entrusted to her care, but that she and her friends were also able to accomplish this heroic deed in defiance of serious opposition (Alia Muhammad Baker had to save the books on her own, with not only no official help, but likely also at considerable potential danger to both herself and the friends who were helping her). Now I do agree with my friend Abigail that it is often difficult to know how to introduce the U.S. military involvement in Iraq to children (and how to then discuss this topic with children). And The Librarian of Basar: A True Story From Iraq has, I believe, avoided showing either the Iraqis or the Americans in a one-sided, us versus them fashion. 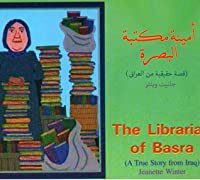 Jeannette Winter's text basically and simply tells the story of one courageous woman, who does what she feels is necessary to keep the Library of Basra's books safe from harm, from the ravages of war. But furthermore, this story also demonstrates most poignantly and with understated sadness, that during war, during armed conflicts, it is often civilians who suffer the most (and not just civilians, but culture, cultural legacies, books, learning, education are also often the victims during armed conflicts, sometimes perhaps, even the intended victims, but more often than not, the unintended victims of war). Fantastic book that I read with my students! So educational and explains what war can do to a country and how important books are. Alia Muhammad Baker is one of the unsung heroes of the war in Iraq. Her dedication to saving books for future generations is a true silver lining to this oppressive cloud of war. "Only Alia is left to protect the books." قصة سيدة عظيمة من العراق العظيم. أحبّت الكتب أكثر من أي شيء في العالم. وجازفت كثيراً من أجل إنقاذ هذه الكتب النادرة من وحوش الحرب. سيدة عظيمة ومُلهمة تُعلّمك كيف يكون الانتماء الحقيقي للوطن، وتستحق أن تُعرف على نطاق واسع. ومن الرائع أن يتربّى أطفالنا على كهذا قصص. Alia was the chief librarian at the Al Basrah Central Library in Basra, Iraq. A meeting place for discussions and connections, Alia loved her job. When war loomed and grew more imminent, Alia wanted to move the books to a safer location. When denied help by government officials, she took matters into her own hands. I just love books about books and I particularly love this story for the sheer courage and strength of the real-life protagonist. Alia wanted more than anything to save the books but she was going to have to do so herself. She started by bringing books home every day. In April 2003, Basra was under attack and the library got hit. With the help of her neighbours, Alia got as many books as possible out. In total, she managed to save 30,000 books, about 70% of the whole content of the library. This simple yet profound work was inspiring. Dealing with war and struggle, this book is as relevant now as it was than. Some might not understand why in the midst of such chaos, Alia would not simply leave. But in books, there is heritage and culture, a place of solace and strength. Alia knew that better than anyone. Though the book deals with war, its done with finesse thus its an appropiate and excellent way to introduce it to children. The illustrations are beautiful. The folk style art perfectly suited the narrative. When Alia's story was first reported, some in her city called her a looter and wondered why she did not take something more valuable. To all of us that love books and reading, we know Alia was saving something quite precious. Once the library was rebuilt, Alia came back as the chief librarian. A great book about a great lady. In the Koran, the first thing God said to Muhammad was "Read". 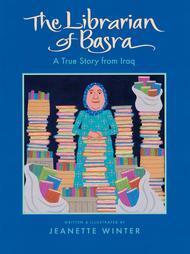 The Librarian of Basra: A True Story from Iraq : I really enjoyed this book. It is important for readers to think about how people in other countries are impacted by events, such as war, from other perspectives. Many children know of the war in Iraq but from the American perspective. I am appreciative of Jeanette Winter for sharing Alia Muhammad Baker’s story and letting us see how the war affected the library and the residents of Basra, Iraq. I also appreciated that Winter noted that the Basra The Librarian of Basra: A True Story from Iraq : I really enjoyed this book. It is important for readers to think about how people in other countries are impacted by events, such as war, from other perspectives. Many children know of the war in Iraq but from the American perspective. I am appreciative of Jeanette Winter for sharing Alia Muhammad Baker’s story and letting us see how the war affected the library and the residents of Basra, Iraq. I also appreciated that Winter noted that the Basra library contained books in other languages, new books, ancient books, etc; this allows children/readers to see that the people in Iraq read about all kinds of people and places just as we do. Children often have a special bond with their local library and will be able to understand how it might feel Iraqi children to have their library destroyed by war. This can open the door to many conversations and hopefully guide children to open-mindedness. The illustrations were colorful and added to the story but it would have been nice to see some photographs or realistic drawings of the town, library, people, etc. My son’s favorite aspect of this book was that the librarian was able to save the books. (Which reminds me how remarkable it is to see a strong Iraqi woman, they are usually portrayed as submissive and weak.) My son also thinks it is unfair that the library burned down, he says that war can’t stop learning. We brainstormed all the different ways the people of Iraq could still learn until they get a new library. 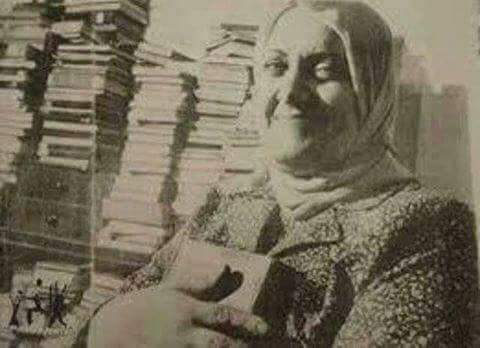 A true story of Mrs. Alyaa the manager of Basra Library whom saved over than 3000 priceless books during the US invasion in Iraq. I encourage everyone to read it. Very interesting true story! Feel proud of this Iraqi Woman. Scott This sounds great! I've added it to my to-read list. Thanks! I'm quite torn over my feelings about this picture book which tells the true story of Alia Muhammad Baker, a librarian in Basra, Iraq, and how she personally endeavors to save the precious books in her library when war reaches Basra. 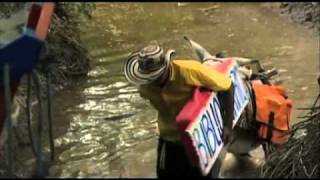 On the one hand, it is a deeply touching story about how one person can make a difference in his/her community, even against all odds, and even inspire others to help. In this case, it is even more poignant in that Alia wants save books--treasure troves of her cultu I'm quite torn over my feelings about this picture book which tells the true story of Alia Muhammad Baker, a librarian in Basra, Iraq, and how she personally endeavors to save the precious books in her library when war reaches Basra. On the one hand, it is a deeply touching story about how one person can make a difference in his/her community, even against all odds, and even inspire others to help. In this case, it is even more poignant in that Alia wants save books--treasure troves of her culture, not just in the history they contain but in the physical volumes that happy, intelligent members of the community held and shared before the war came. At the same time, I couldn't help but feel that I wanted more from this book. Some of the things that were included seemed a bit too frightening for younger children, yet the text was generally sparse and didn't provide enough information for older readers (or adults). Also, I was a bit confused over some elements, such as why the library was in danger but not the restaurant next store? I could see children having many questions, such as why the soldier seemed concerned over the restaurant owner having a gun, yet decided not to search the restaurant. Moreover, while on one hand, I appreciated why the author might wish to keep certain aspects were a bit vague (it is never specifically stated who was fighting whom) I also found it was also a bit frustrating. For example, my guess is that showing the Caucasian soldier (in US military attire) was to acknowledge the American involvement, but then, why show only a Caucasian to represent all of America? Again, young children may not understand enough as it seems a great deal is implied,or the reader is already expected to know about the Iraq war, and older children who are more aware may be frustrated by the lack of depth. Maybe the fact that I didn't love this book shows my own ignorance about some of these issues, but, again, I would have liked this book to enlighten me more. Man, I hate writing reviews for books I don't have in front of me, but the book was due at the library and I couldn't renew it. So, here we go! First off, I need to confess my bias ... I'm the kid of Iraqi immigrants so I might have a warmer, fuzzier case of the warm fuzzies for this. Anyway, this is the tale of a librarian who, knowing war was coming, was determined to save the books in her library. She had no official help (i.e., from local government), so she went ahead and did what she could t Man, I hate writing reviews for books I don't have in front of me, but the book was due at the library and I couldn't renew it. So, here we go! Anyway, this is the tale of a librarian who, knowing war was coming, was determined to save the books in her library. She had no official help (i.e., from local government), so she went ahead and did what she could to smuggle books out, with help from friends and neighbors. To say more would essentially tell the whole tale, since this is a picture book. Speaking of picture books, I suppose I can see why this book has been banned (oh, did I forget to mention that? Yes, I did. I went to the library one day and there was a display on banned books, in honor of Banned Books Week, and I went ahead and borrowed it. ), as the age group it's intended for and the subject matter don't seem to go together. It's a book for smaller kids, but it's a book about war. I'm never in favor of banning books, but I am a strong believer in parents figuring out what is appropriate or inappropriate reading material for their children, and I can understand parents saying they don't want their kids reading this. On the plus side, the author doesn't pose an opinion on political things. There's one illustration that includes a non-Iraqi soldier, but, again, he's not painted as a positive or negative figure. He just is. Hey, maybe we need more books like this. A real worthy book aimed for kids to teach them part of what happened in Iraq through a simple illustrated story and to raise the awareness of the importance of learning, books and reading. I just bought this book in ebook format today and completed it. I was prompted to read The Librarian of Basra because of the recommendation of it by one of my Goodreads friends who is Iraqi and the controversy this innocent book has caused in this country. I am always skeptical when a Westerner, especially American, writes about a non-Western country or culture because many of these authors have a bad track record of making fantastically false presentations and setting up propaganda to make the I just bought this book in ebook format today and completed it. I was prompted to read The Librarian of Basra because of the recommendation of it by one of my Goodreads friends who is Iraqi and the controversy this innocent book has caused in this country. I am always skeptical when a Westerner, especially American, writes about a non-Western country or culture because many of these authors have a bad track record of making fantastically false presentations and setting up propaganda to make the other side look bad or very primitive in a brutal or ignorant sort of way. But sometimes with authors of children's or YA (young adult) books this is not always the case I've noticed. Many of the authors who write for the young do not have a negative agenda of war propaganda and personal bigotry. They merely want to tell a good story and present a culture to young people that they probably aren't familiar with. This book for young children is one of these with a positive message which some parents here in the US, who probably never bothered to read the book have managed to use their fear of and bigotry against Islam to try to have this book banned in some school districts. The theme of The Librarian of Basra is not about religion. Yes, at the beginning of the story it says that God told the Prophet Muhammad to read, but nothing else is said about Islam. This book is about a courageous Iraqi librarian who was so passionate about the books under her protection, some new, some old, some centuries old and a part of her nation's heritage, that she is determined to save them from war. The library which she ran in the southern Iraqi city of Basra is also a gathering place for people to relax and have intellectual discussion. Yes, libraries get bombed in wars, and America has been and continues to be involved in the cultural destruction of nations. When I visited a Byzantine exhibition here in my hometown about eight years ago and saw artifacts from Greece, Syria, and Turkey that were a part of a private collection gathered back in the 1920s, it became clear to me for the first time that many rich white Western elites were in and still are in the business of trafficking the antiquities of non-Western nations. But getting back to the book, there is nothing dangerous here. American children and Americans in general need to learn about other cultures because we live in a globalized world, it's far past time that we let go of our fear, bigotry, and ignorance about the world off America's shore, and also because most cultures are older than this one and often have more meaning and excitement than American culture, which has no real historical basis and is always changeable and based on fads and consumerism. This book's message is not about religion, but about the love of books, an ancient nation's heritage, the bravery and diligence of one woman, and how war disrupts and ruins the lives of innocent civilians. If I had to do it over again, I would have gotten a hard copy of the book. The pictures and the writing were small on my Kindle Fire. Even so, the pictures in this book are very colorful and well done for a children's picture book. I'd hope this book would inspire children to want to learn more about Iraq, and since America has been at war most of it's 230 or so years, begin to ask questions why this country is always in a constant state of war with countries that are always so far away and of no physical threat. I was so happy to see that the Iraqi people and Muslims were not demonized in this book the way they have been in adult media for the last 15 years. The characters are dignified and smart, and it's time that our citizens of all ages become aware of who the real barbarians are. An amazing true story of an amazingly brave librarian! Thanks for the rec Ridha! A true librarian! I probably would have done the same thing were I in her shoes. The thought of destroying books-- unthinkable! The Librarian of Basra: A True Story from Iraq by Jeanette Winter, based on a New York Times article of July 27, 2003, tells the story of Alia Muhammad Baker, head librarian of Basra, Iraq who helped save 70% of the library's collections before the library burned during the Iraq War. An author's note gives backgound at the end of the book. This was a March 2012 selection for the library topic for the Picture Book Club at Goodreads. Winter's colorful, bold illustrations were done in acrylic and pe The Librarian of Basra: A True Story from Iraq by Jeanette Winter, based on a New York Times article of July 27, 2003, tells the story of Alia Muhammad Baker, head librarian of Basra, Iraq who helped save 70% of the library's collections before the library burned during the Iraq War. An author's note gives backgound at the end of the book. This was a March 2012 selection for the library topic for the Picture Book Club at Goodreads. Winter's colorful, bold illustrations were done in acrylic and pen. Among the striking images include bringing books home, war reaches Basra, soldiers abandon library, passing books over wall, fire burns library, and the last two images. 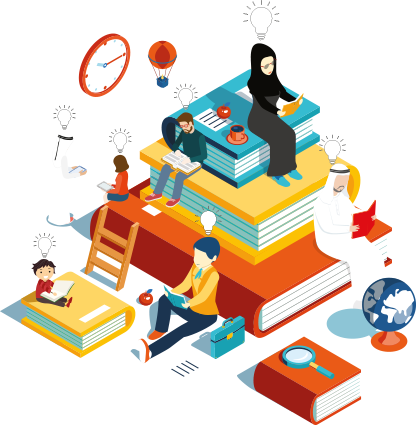 This inspiring true story tells how Alia Muhammad Baker saved many of Basra's library books at considerable potential danger to both herself and the friends who were helping her. By focusing on the story of the library, Winter is able to show the war in Iraq without going into the politics of the situation. The United States is never mentioned in the text, nor is the U.S. military and their bombing and destruction during the war. The value placed on books and literature is shown. Some very sensitive children could be upset by some of the images. This is recommended for school and public library collections. Well, I was not expected the booklet to be that short. It is directed for children, I suppose, so that's why. The picture book shows moderate artwork, and the story is OK for kids. I think it would give them a boost on how valuable books are that even at the times of dismay, Alia couldn't just leave them be. A Book is a treasure, and a treasure must be treasured by all means. Cool lesson, from a true story. قصة حقيقية وجميلة بالفعل..يمكن تحويلها إلى فيلم دراماتيكي غاية في الروعة..
One thing about which I’m perplexed is if the saving of the books happened in exactly this way, their survival was a matter of chance. Maybe the restaurant and not the library could have been bombed? So, I didn’t really like the spare text. I didn’t like that the story (sans beginning quote and author’s note) seems almost generic. Who’s doing the bombing is certainly not addressed. All these things aren’t necessarily flaws but I was expecting to read more detailed history. 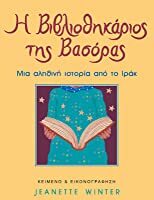 I did enjoy the look of the illustrations, loved reading about the saving of so many books, of course, and enjoyed the brief description of some of the books and types of books that were in the library. I’m not sure who the target readers are. Not very young or very sensitive children, but perhaps older elementary school children, preferably kids who know something about these events or who will have their questions about them answered. The story is definitely inspiring, and would be good to read in concert with discussions about war, collaboration, bravery, friendship, and the importance of books, and the similarities between the world’s peoples. This is a sad, but heartwarming tale about how war tears apart the foundations of society. One librarian strives to protect her precious books, books that are hundreds of years old and cultural relics. This story was selected as one of the books for t This is a sad, but heartwarming tale about how war tears apart the foundations of society. One librarian strives to protect her precious books, books that are hundreds of years old and cultural relics. Inspiring story of Alia Muhammad Baker, the librarian who rescued 30,000 books from the Basra library during the Iraq War in 2003 and hid them in her home, the homes of friends, and a nearby restaurant. I read today in the National Coalition Against Censorship's e-newsletter that one of Ms. Winter's other books, Nasreen's Secret School: A True Story from Afghanistan, is being challenged by parents in Wisconsin, but that book was checked out so I found this one. 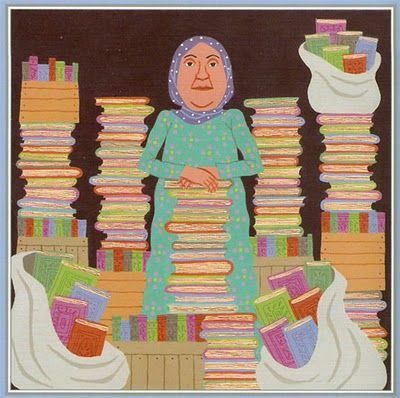 This is a lovely piece about the h Inspiring story of Alia Muhammad Baker, the librarian who rescued 30,000 books from the Basra library during the Iraq War in 2003 and hid them in her home, the homes of friends, and a nearby restaurant. I read today in the National Coalition Against Censorship's e-newsletter that one of Ms. Winter's other books, Nasreen's Secret School: A True Story from Afghanistan, is being challenged by parents in Wisconsin, but that book was checked out so I found this one. This is a lovely piece about the horrors of war, the necessity of reading and culture, and the ways that communities in ravaged countries can work together to preserve cultural and historical treasures. Looking forward to when my copy of Nasreen's Secret School arrives. Borrowed this from PNM via Overdrive. I love the illustration. But the story-telling pace is a bit off for me. Can't imagine the actual struggle to take good care of the books Alia Muhammad Baker owned from one place to another safely. 30,000 books!!! When you love books and realize the importance to preserve it, no difficulty come in the way will be able to stop you. I'd like to develop some sort of "librarian appreciation" unit that injects a little world view, and came across this book as a recommendation in the NYSUT newsletter. I think it might work best with middle school students, but I'd use it in high school as well, as I'd like to develop some sort of "librarian appreciation" unit that injects a little world view, and came across this book as a recommendation in the NYSUT newsletter. I think it might work best with middle school students, but I'd use it in high school as well, as I think most American teenagers may not realize how lucky they are to have a public library at their finger tips, not to mention education in general. This book is set against a backdrop of an invaded Iraq. A librarian who finds her library in danger of obliteration by the hands of the soldiers moves all the books to her and her friends' place. This is a story which celebrates the joy of reading books. It is rare to find people who are ready to give up their lives to save books. This picture book narrates in a benign manner how books can become more cherished and dear to your heart than even your life. Books have empowered us a It was wonderful! This is a story which celebrates the joy of reading books. It is rare to find people who are ready to give up their lives to save books. This picture book narrates in a benign manner how books can become more cherished and dear to your heart than even your life. Books have empowered us and given voice to our thoughts and emotions. They are not just words written on paper. Another banned books selection. This true story is about a librarian who saved 70% of her library's books knowing that the likelihood of our being bombed and burned was high. Another one I wouldn't hesitate to put in the hands of a child. I would love to find out more about this woman!